For many families living in poverty in Fiji, underwear is a very basic need that can be the most difficult to acquire. School girls miss up to four days of attending school, simply from not having access to adequate items of clothing, such as bras and underwear. Issues such as this are never publicised, because of traditional taboos and the weights of other challenges, in and amongst poverty stricken homes. The aim of this project is to bridge this gap in a small way, by providing these girls with clean and decent undergarments, build their self-confidence and most importantly, restore their dignity. 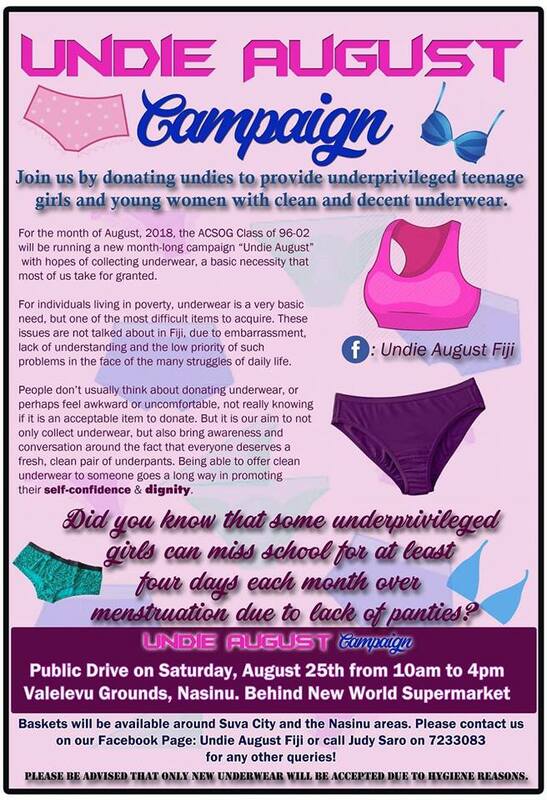 Clean and decent undergarments are being collected for Underprivileged teenage school girls who come from poverty stricken backgrounds in Fiji. If you are able to make any financial contribution or purchase some underwear and contribute to this project please contact Silo Kikau via email (shilokikau@gmail.com) or mobile )0422 866 864). Your kind donations can be delivered to 18 Circlewood Court, Algester, QLD 4115. Please do not hesitate to contact Silo if you have any queries. Next Post Get your tickets to our PWA Multicultural Day 2018 Celebrations!